Today is Harry Potter’s birthday! Someone out there, please reassure me you already knew that and I’m not alone in my love of all things Harry Potter. When book 7 came out I was on vacation with my family for a wedding out in California. I made sure to get in line to get early access to the book and I managed to finish the final Harry Potter book before the wedding that night. When the final movie was released I had a multi-day viewing party with a themed food for each viewing. 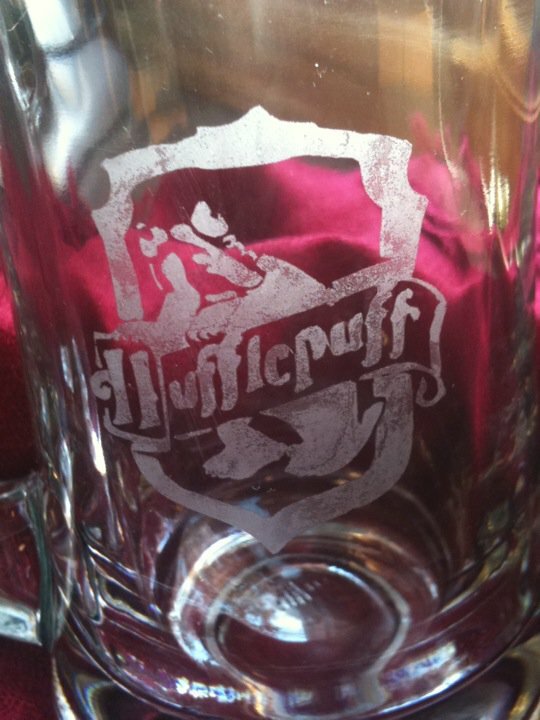 The first thing I did was make some cups to drink my Harry Potter themed drinks in. Even a house like Hufflepuff deserves a mug. The mug itself was fun to design. I found some images for each Harry Potter house and used some software to edit them so I could cut them out with my Cricut. I placed a Cricut vinyl sheet into my Cricut and cut out the design with that so I could adhere the stencil to a Target-brand mug. Then I filled the gaps in the stencil in with some Armour Etch . You just dab the Armour Etch on with a foam brush and let it sit for a few minutes before washing it and the stencil off. The glasses are dishwasher safe and make great party favors- I made a batch for a group of friends for another themed movie night. 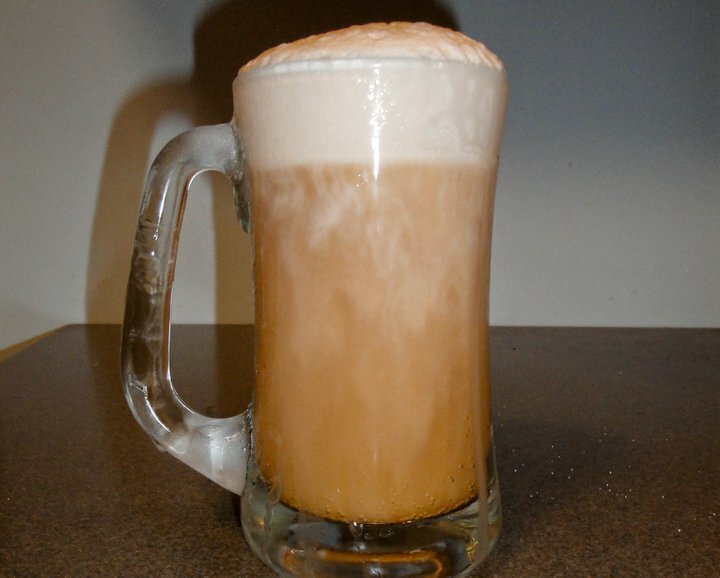 The glass was a perfect container for my homemade butterbeer. I haven’t made it to the Wizarding World of Harry Potter but this is a tasty drink to make at home. I followed a recipe from Chica and Jo and had great success. 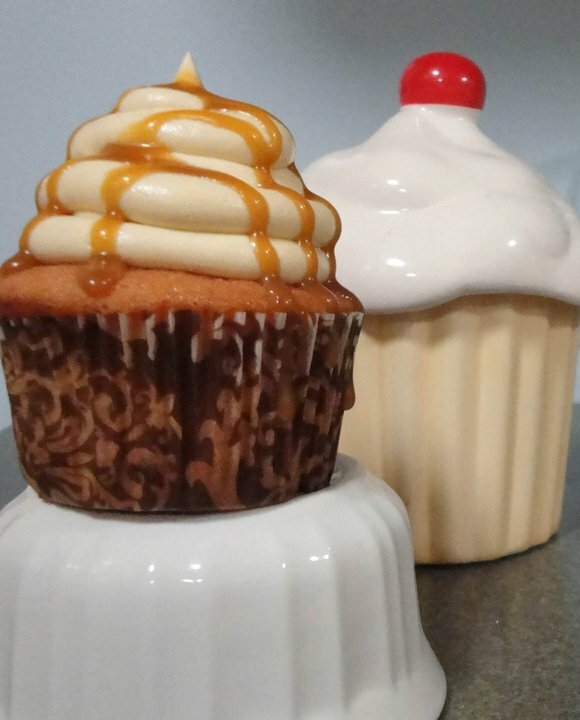 The butterbeer cupcakes from AmyBITES are amazing. They were my second favorite creation of the week (second to only butterbeer) and were excellent when paired with its namesake. Movie night #4 featured a Bouillabaisse in honor of one of the dishes served during the welcoming feast for guests from Beauxbatons Academy. 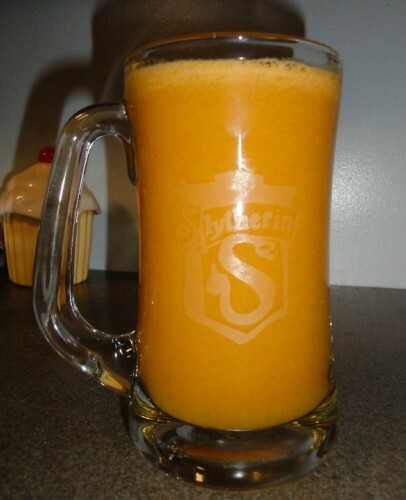 Every Harry Potter party needs a main course but it also needs an appetizer. Movie night #5 featured a sorting hat bread with several dips. Diamonds for Dessert has a great tutorial for making a shaped sorting hat. My version required more flour thanks to the Missouri humidity and it came out a little cranky but still recognizable. And what’s a party without a dessert? For my Harry Potter themed dessert I made some Oreo truffles. Instead of dipping them in milk chocolate or dark chocolate I dipped them in some yellow candy melts. 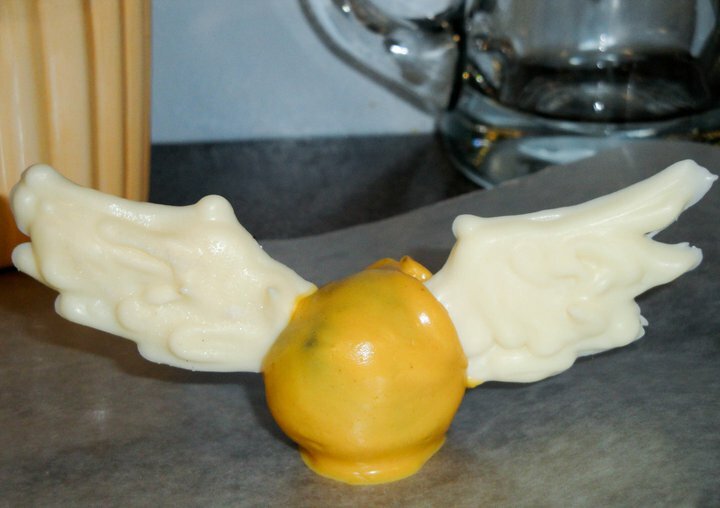 I also attached some white chocolate wings I had piped and made some flying snitches. I will admit that I only ended up making one with wings and the rest of the wings went straight into my mouth. They just tasted too good! Now you know one of my biggest secrets: I have a weakness for themed parties and celebrations. I’ve been known to have Election night parties, a luau where my dog wore a Hawaiian skirt, and even sparkly vampire parties. Parties are a great way for me to get together with friends and family and have fun with corny foods and props. Is anyone as obsessed with the Olympics as I am? Back in 1996 I watched the Atlanta games obsessively. I still have a tote bag my mom bought me with the logo on it. I wrote a report on the US Women’s Olympic gymnastics team, nicknamedThe Magnificent Seven. 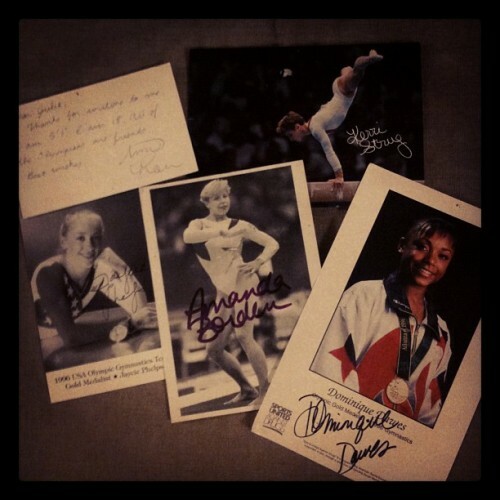 I wrote to all the women on the team and just this week I broke out the 5 responses I received (I’m still waiting on you Shannon Miller and Dominique Moceanu). My husband wasn’t sure whether to be amazed at the stuff I hold onto or disturbed about my fandom until I broke out my books published back then. I didn’t even show him the poster I had! 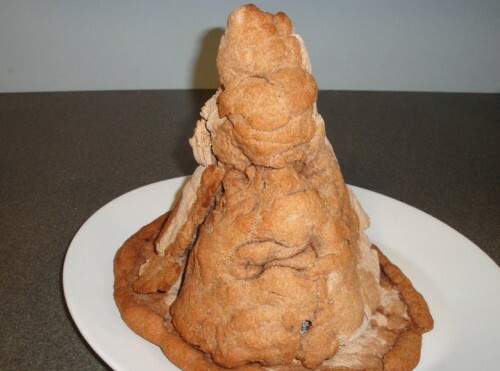 In an effort to show off my super nerdy side, I made a dessert perfect for your Opening Ceremony party. What’s that you say, you aren’t having an Opening Ceremony party? IT IS NOT TOO LATE! You are so lucky I’m here. Do it for America, do it for me, do it for your love of all things miniature, or do it because cherries are on sale this week. 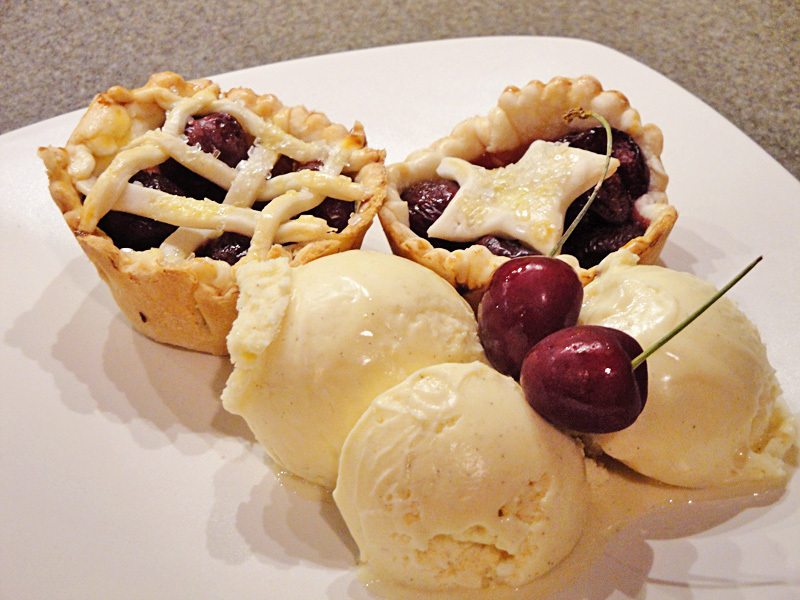 You need these mini cherry pies and any reason will do. 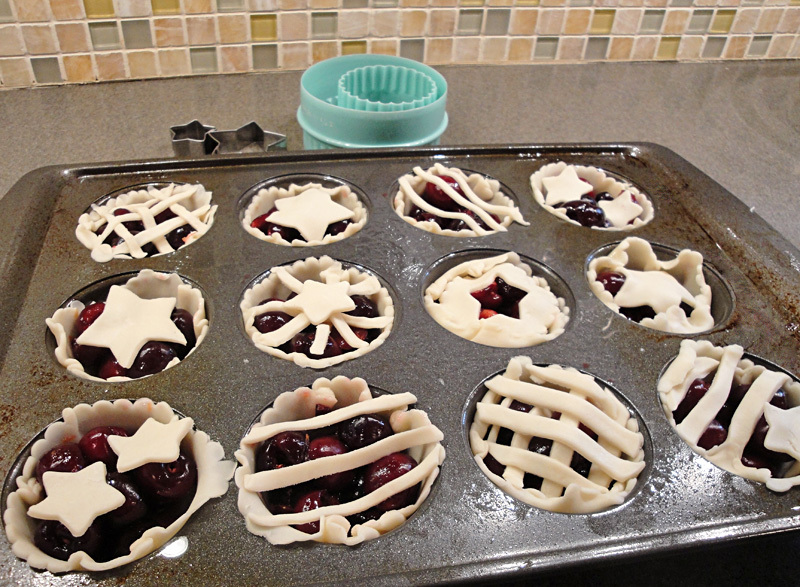 These mini cherry pies use a store-bought pie crust for convenience but you can easily use your own favorite recipe. You might just need to adjust your filling levels to fit. 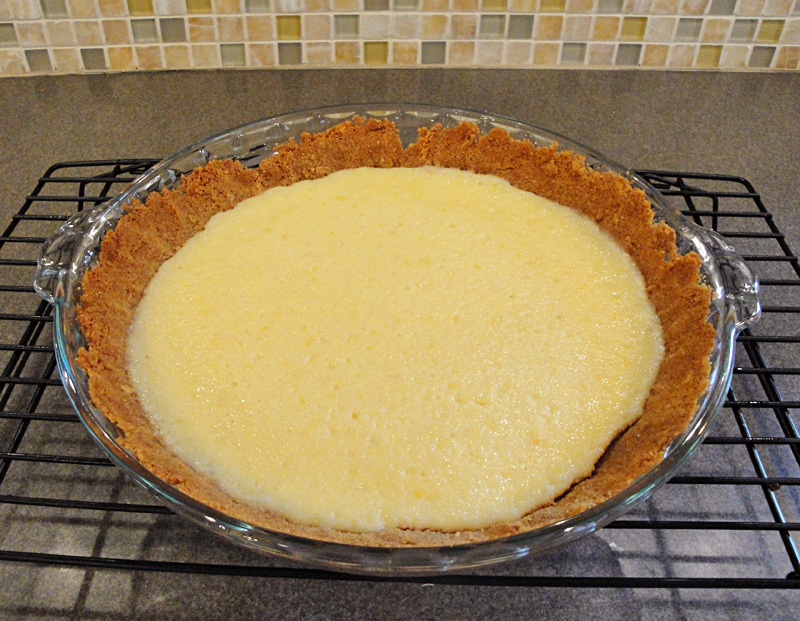 The filling I use here comes from Recipe Girl and it’s a great tart base. You could go with a premade cherry pie filling but you’ll have a sweeter final result and fresh cherries are so worth it. I used a small star cookie cutter to cut out some star designs and I rolled some dough out and cut it with a pizza cutter to form stripes. Have fun with these designs and sprinkle them with plenty of sugar before baking. Preheat oven to 350 degrees. Spray 8 of your cups in a muffin tin with nonstick spray. Roll out the pie crust into a thinner layer. Use a biscuit cutter to cut out 5 inch rings. You'll want to cut out 8 rings. Set your extra crust aside. Line your 8 prepared muffin cups with the dough starting from the center and pulling up the sides. 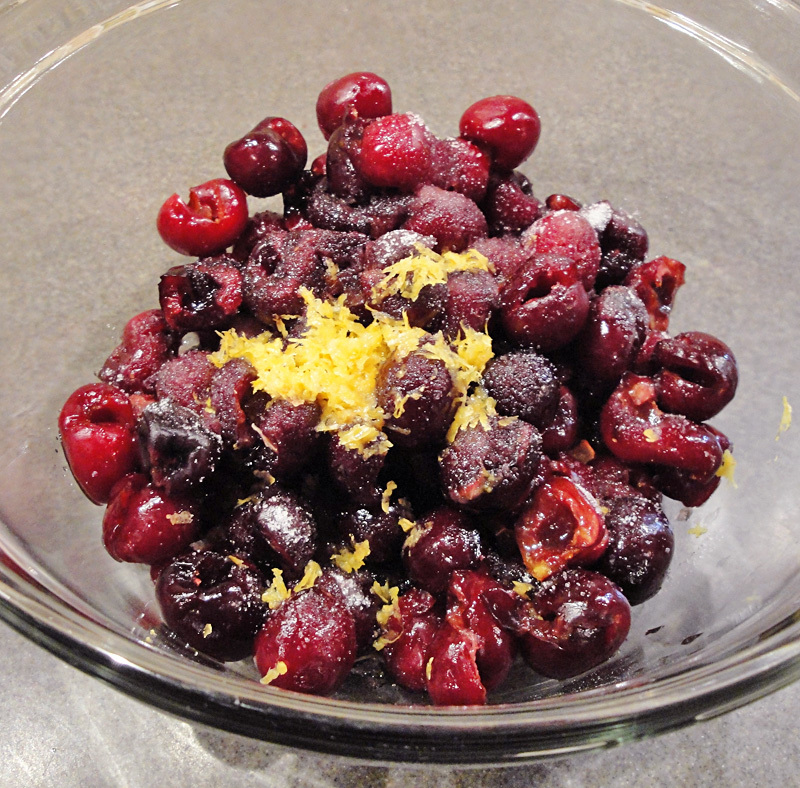 In a large bowl, stir together cherries, sugar, lemon zest, lemon juice, cornstarch and salt. Spoon mixture into your pie crusts. Use your leftover pie crust to cut out designs. Stars and stripes are perfect! 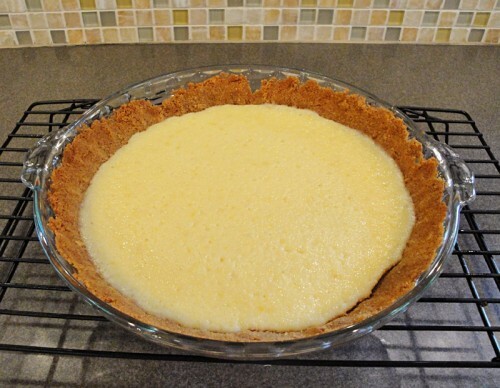 Combine your egg yolk and milk/cream to form an egg wash. Brush the wash lightly over your pies and sprinkle with coarse sugar. Bake 20-25 minutes (watching carefully) until crusts are browned and the filling starts bubbling. Cool at least 15 minutes before eating. Serve warm with vanilla ice cream. I’ve been absent from this site a little too much for my own liking lately. It started with work getting crazy again and all the exhaustion that comes with that. On top of work, I’ve also been pushing my body harder than I’m used to and it has been wearing me down. On the plus side, it’s also been building me up. Confused? I’m talking about the Couch to 5K Program. 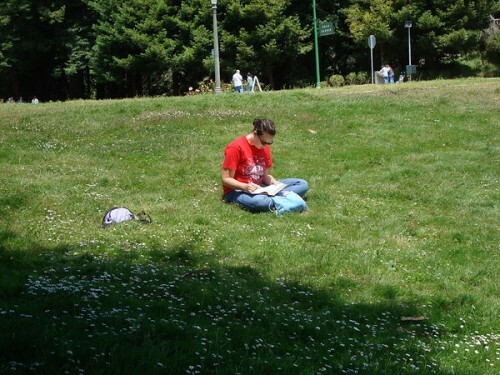 Also known as C25K, it’s a program to ease couch potatoes into runners. I was an active kid, even making the alternative team for state swimming back in the day, but I’ve never run even a mile straight through. I could do kick-boxing, bike, even yoga but running killed me and for some reason I always hated being beat by something that seemed as simple as running. A lot of my friends and family have seen me talking about the program and are a little confused on the details so I wanted to share how exactly the program works, some helpful tips, and how it’s been affecting me and the family. I’m obviously not a running pro but I’m loving this program, minus the fact that I started it in Missouri’s worst heat wave. The program lasts 9 weeks and you gradually build yourself up, running longer distances and times. You run 3 times a week on alternating days and you start each day with a 5-minute warm-up walk and end each day with a 5-minute cool-down walk. Weeks 1-4 you repeat the same thing all 3 days you run so it’s fairly straightforward. 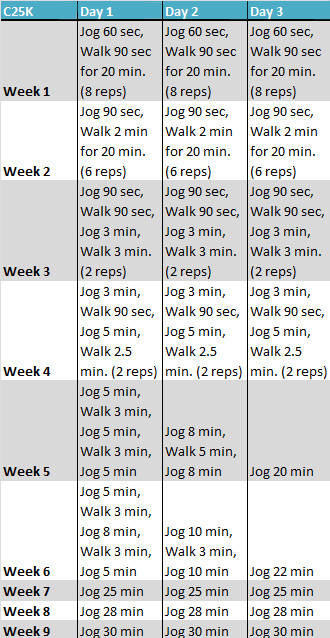 Week 5 is where you start to increase your running time quickly and you run for 20 minutes straight for the first time. I just completed Week 6 Day 2 (W6D2) so I won’t be doing any more walking other than warming up or cooling down. 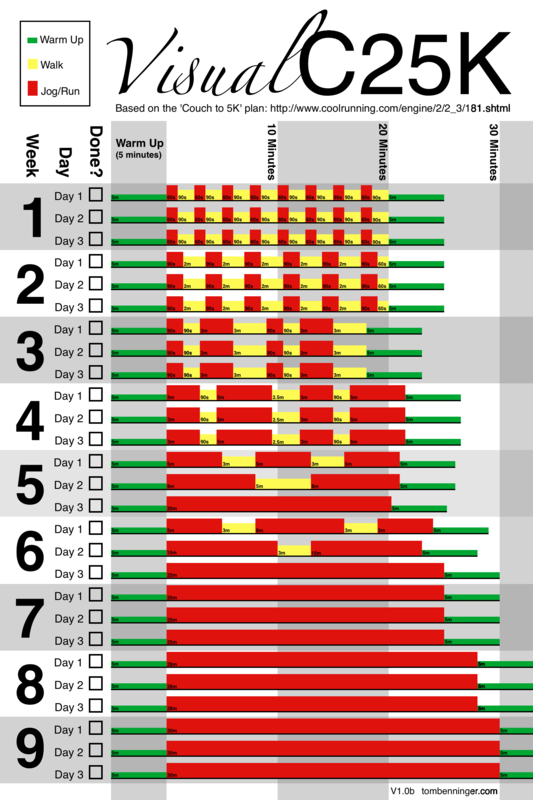 Here’s a chart that shows visually when you run/walk. My husband is doing the program with me and so is my dog. My husband is just a touch behind me since I started a bit ahead of him but he just ran right through Week 4 so he’s right on my toes. Week 4 is one of the hardest weeks of the program in my opinion. Week 1 is hard because you’re just getting started but week 4 is when you increase your runs from a total of 9 minutes to a total of 16 minutes. It’s a huge jump so be prepared to be exhausted that week. The best part about having my husband as a running partner is that he holds me accountable. He wants to run so I run with him and we each keep encouraging the other. Even my dog keeps me accountable. If I don’t take her running on her running days then she gets crabby and no one wants to see her crabby side. 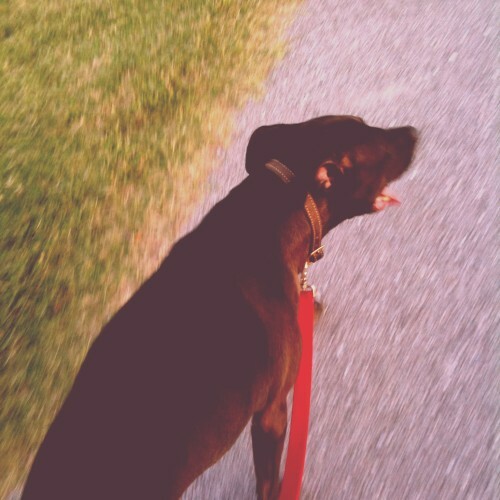 Running with my dog is also a challenge. I wouldn’t suggest running the C25K with a small dog because they might not be able to keep up. My dog has had advanced leash training which makes running with her so much easier. Some commands I’ve found helpful are “heel” so she’ll stay close to me when cars or people are near, “leave it” when a person with an animal is near, and “turn” for when we’re at a split in the road and I use the leash to guide her. My dog Nova loves the runs though and she cruises right along with me each week. I also used snapping or an “easy” command to help her increase or decrease her speeds as we shift between running and walking. Have all the tools you need. Buy proper running shoes from the start so you don’t get injured. I also find having good workout clothes (including socks and underwear) to be a must as well as having a hat and sunglasses. This isn’t a race. When you finish the program you might be ready for a race but until then keep your pace slower than what you might think. If you are a couch potato running too fast might lead to injury. You should be going slow enough to be able to talk while running. I test this by giving commands or praising my dog mid-run. Be realistic with your goals. I hope to sign up for a 5K when I finish this program but I know I might not actually end up running a full 5K by the end of Week 9. I’ve included extra time before race season starts to allow for rest days, building up my running distance, and even time in case of injuries. I do have some knee problems that led me to repeat a day once but I still have plenty of time to reach my goals. Now that I’m about 2/3 of the way through the program, I have 2 races in mind to test my skills on a course depending on how ready I feel. Find a program that works for you. Maybe you need to go inside on a treadmill to run in this heat or maybe you need to do some Week 0 exercises to build up the strength for a full program. My friend Janelle is doing a 12-week C25K program that is working great for her and her husband. Track your runs. This one is big. 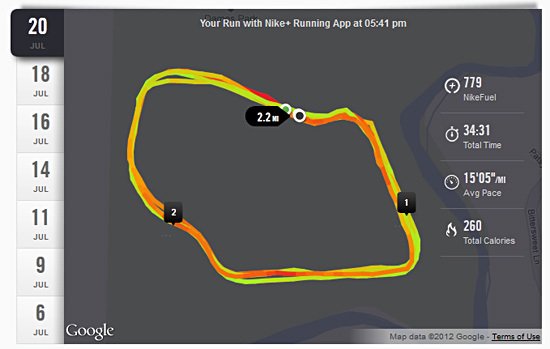 I use the Nike+ running app but other people use apps on their phones like Runkeeper. I like logging my distance, my speed, and how much stronger I’ve become. To help follow the intervals I use podcasts with my runs. They tell me when to start walking, start running, and have music to help me keep my pace during the runs. My current favorite podcasts can be found over at C25kplaylists.com. I like the robotic voice prompts, the cues for being halfway and near the end they often let me know I have just a few minutes left. Each week has between 4 and 8 different music options. Other great choices include Chubby Jones (a very encouraging voice pushes you while you run to music), Podrunner Intervals (DJ Beatsmith uses beats per minute in songs to keep you at a steady pace), and Robert Ullrey (a man running this program with you to the beat of techno songs). Have you tried the Couch to 5K program? I’d love to hear your tips or any questions you might have about my experience so far. Did you know yesterday was National Ice Cream Day? 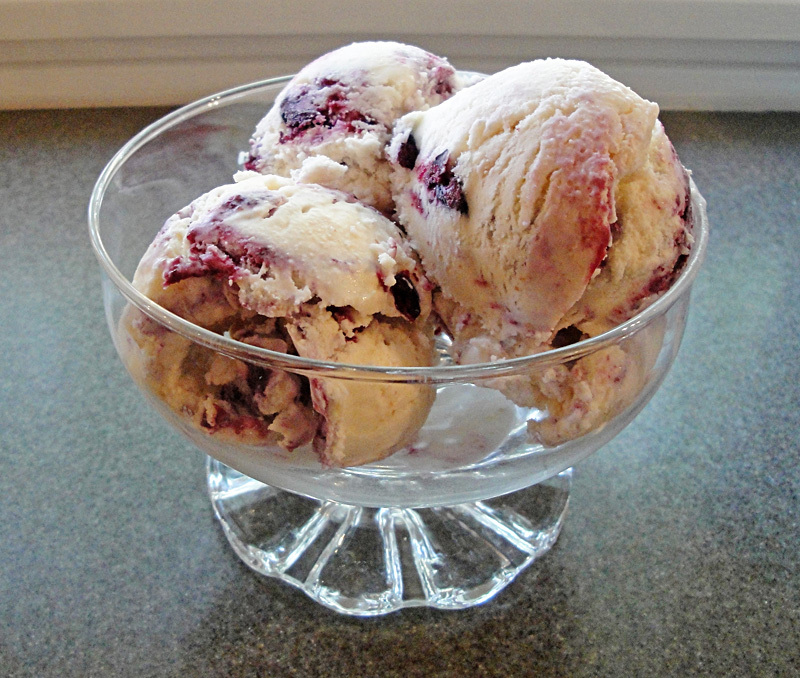 I didn’t until I already had made my latest batch of homemade ice cream. I think it was fate that brought us together. That or David Lebovitz – whose ice cream recipe I’ve adapted for today’s ice cream. This is my final recipe left from my blueberry picking day. Sadly the patch has all been picked so now I’ll have to go to the grocery store if I want any more berry recipes. I wanted one last recipe that tasted like blueberries and cream so I decided to go the ice cream route. I had some graham crackers leftover from my other desserts so I incorporated them into the sweet cream base of this ice cream. I heated up my berries with some sugar and boiled out some of the excess water (taking a cue from Jeni and her splendid recipes) and incorporated that into the final product. The result? a creamy graham cracker ice cream base with tart blueberries swirled in. 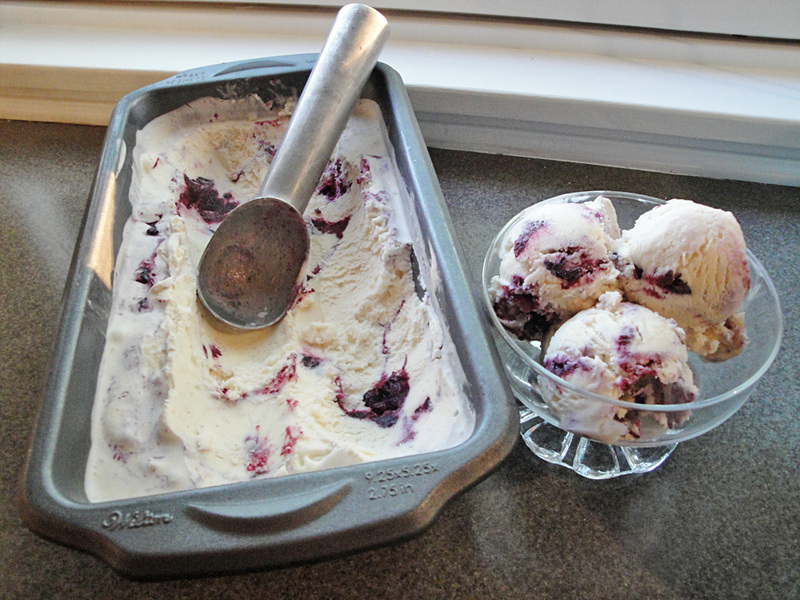 Blueberry pie ice cream is an improvement on the usual blueberries and cream. In a small saucepan heat blueberries and sugar over medium high heat. As you stir, press the blueberries against the side of the pan to help release the juices. After 8 minutes, pour into a small bowl and place in the fridge to chill for an hour. Grind the graham crackers into crumbs using a food processor or with a Ziplock bag and a rolling pin. Completely crush them and set aside. In a medium sized pot, heat 1 cup of cream with sugar and salt. Over medium heat, stir the mix together until the sugar has fully dissolved. Remove pot from heat and stir in the remaining cream, milk, and vanilla. 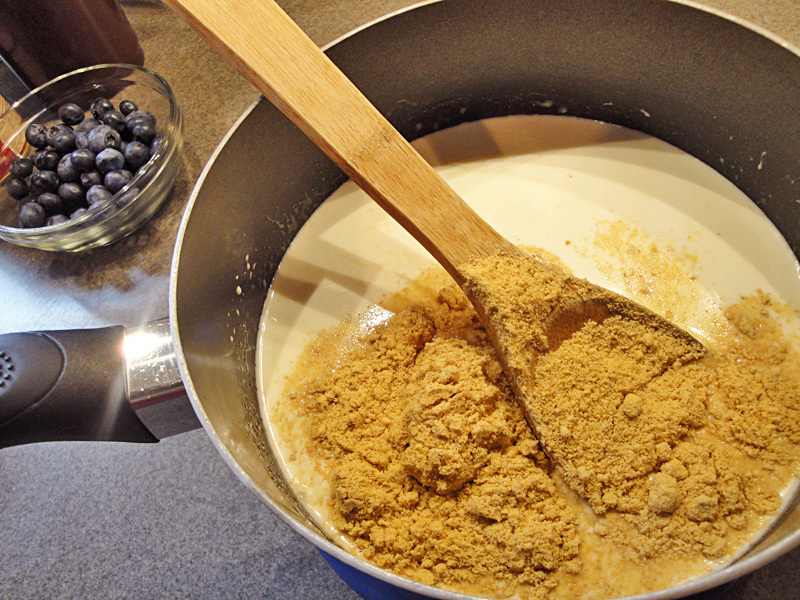 Add the graham cracker crumbs and stir till just combined. Chill in the fridge for at least an hour. After the ice cream base is fully chilled, pour it into your ice cream mixer and let it run for about 30 minutes (or the time indicated by your device). During the last 5 minutes of your ice cream maker's run, pull the blueberry mix out of your fridge. Lightly cover the base of a metal loaf pan with blueberry mix. When the ice cream finishes mixing, pour 1/3 of the ice cream into your pan. Top with 1/2 of the blueberry mix, then layer another 1/3 of the ice cream. Finish by layering the remaining blueberry mix and then the last 1/3 of ice cream into the pan. Run a knife through to gently swirl the mix together and refrigerate overnight before serving. Back in the 1930s, a challenge was issued to students at the Parsons School of Art & Design. The designer “challenged students to design a table so basic that it would retain its integrity whether sheathed in gold leaf, mica, parchment, split straw or painted burlap, or even left robustly unvarnished.” (NYTimes) The resulting table was named the Parsons Table. The favorite Parsons desk of most folks these days is produced by West Elm. It costs $349, has two drawers, and is 48″ x 24″ x 30″. 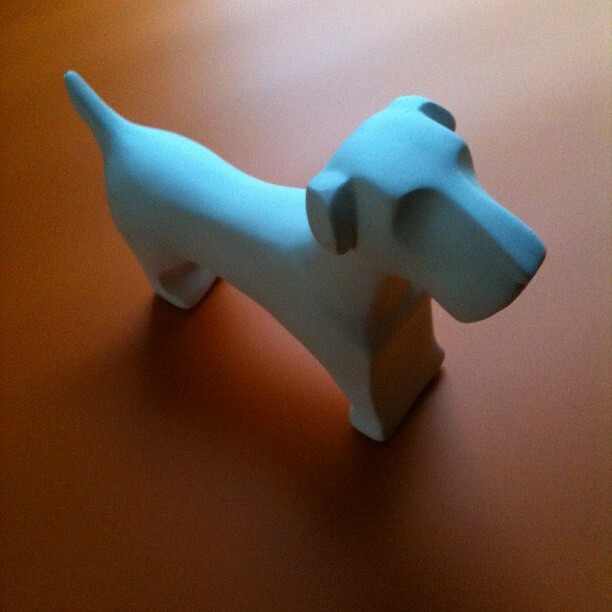 You can buy it in black or white. Don’t think Parsons desks have to be boring. Remember the goal of making a desk that looks good in every material? There are so many options below with different looks. All those designs also mean different price points so you should be able to afford a Parsons desk no matter your price point. These are 4 additional West Elm options. 1-Parsons Mirror Desk ($599), 2-Parsons Natural Grass Cloth Desk ($499), 3-Parsons Diamond Grass Cloth Desk ($499), and 4-Parsons Metal Desk ($499) made of wood with hand-wrapped rich antiqued metal cladding. Each is the same size as the original and has two drawers. Another option is through Room & Board. 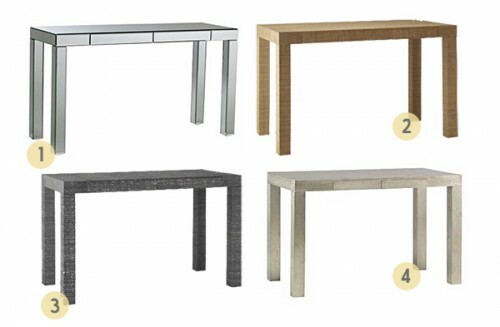 They have a customizable Parsons desk with 10 different table sizes and 24 different tabletop surfaces. 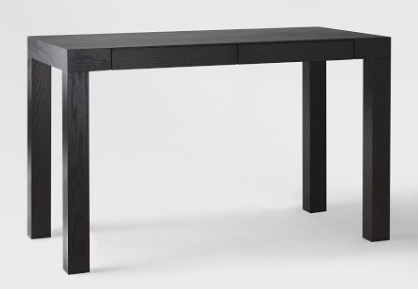 To get the closest size to the Parsons, choose the 48″ x 24″ x 29″ console table/desk. You can choose glass, MDF, butcher block, solid wood, quartz, granite, or even marble. My favorites are with the white glass (#5- $619) and with the Solid maple with shell stain (#6- $699). Parsons desks can be found at lower costs too with just a few changes. The 7-Overstock Student Desk ($144.99) is the closest match with almost identical dimensions and 2 drawers. 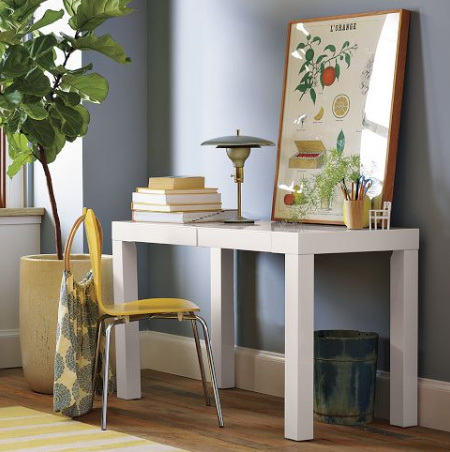 8-Home Decorator’s Parsons Desk ($106.24-$129) comes in 6 different colors though it only has 1 drawer. The 9-Container Store’s Parsons desk is a mixture of steel and melamine without any drawers and can be found in stores for $129. Though a little narrower and with only 1 drawer, you can get a Parsons desk from Walmart (#10) for $59. 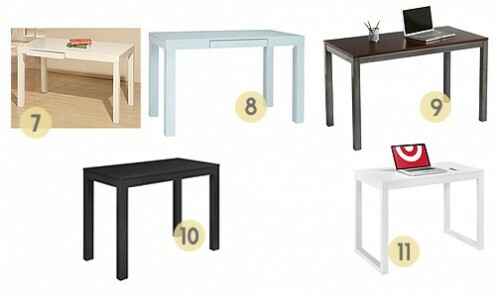 The cheapest of all is smaller, drawerless, and has different legs but Target’s Parsons desk (#11) is only $39.99. I’ve shared my love of Parsons desks but I’m curious if any of you have any Parsons pieces. I just bought my first piece after my last sales post. Here’s a glimpse of it. Have I gone completely crazy? I mentioned last week that I’d made two blueberry cheesecake dishes and one was a White Chocolate Blueberry Cheesecake for my husband. 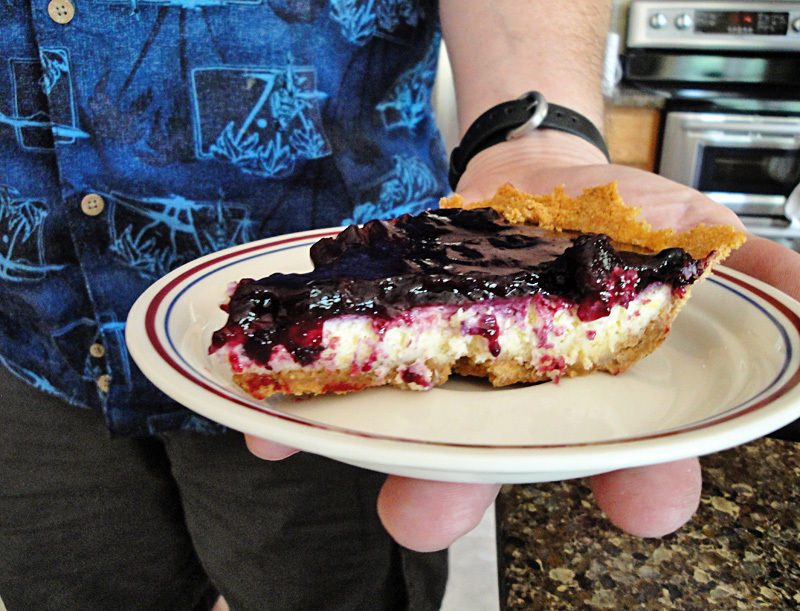 The other is today’s recipe, a Blueberry Cheesecake Pie. The recipe comes from Mel at Mel’s Kitchen Cafe. This cheesecake doesn’t even require a springform pan or a water bath so it’s a very easy recipe to make. In a small bowl, combine the crushed graham crackers, sugar and butter. Pat the crumb mixture into a 9-inch pie pan and bake for 8 minutes at 325 degrees. Let the crust cool completely. After the crust cools, zest your lemon into a medium bowl. Add in the cream cheese, sugar, and lemon juice and and beat until smooth. Mix in the eggs until just combined. Pour into the graham cracker crust and bake 25 minutes at 325 degrees. While the custard is baking, combine the berries, water, and sugar in a medium saucepan and bring to a boil. Reduce the heat and simmer, covered, for 5 minutes, stirring once or twice to prevent sticking. Remove from the heat and add the cornstarch mixture. Return to a boil and cook for one minute, stirring constantly, until the mixture is thickened. Remove from the heat and cool until the mix is warm but no longer hot. After the cheesecake is finished, leave it out until the berries are warm. Spoon the berries over the cheesecake and chill for 1 hour. It’s time once again for this month’s Get Organized Now checklist. Last month I feel like I got so much done but now I’m in a dreadful heat wave so I’ll only be working on indoor tasks until it cools down. That means I’ll be working on clearing out some old junk instead of pushing ahead on my flower garden but progress is progress. July 4: Enjoy the holiday but be careful out there! I’m in a major drought so locals should avoid fireworks so we don’t end up with even more fires. Be careful on the roads too. July 7: It’s probably time to take care of your plants. Pull back any dead parts, add more fertilizer, and see what’s working and what isn’t. The drought is causing all my plants to die and it’s a losing battle but I’m out there with my watering can every day trying to win the battle. July 9: Restock all your cleaning supplies and paper goods. Decide if you really need 8 different containers for cleaning or if you can find a better multi-purpose cleaner or even a greener one. 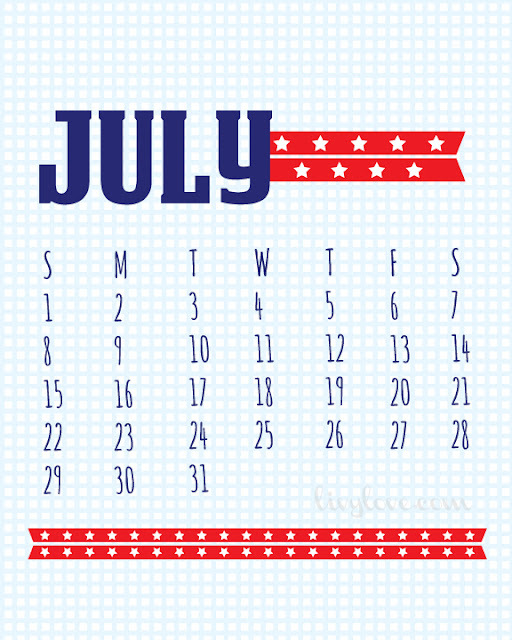 July 12: Pull any stained or damaged clothing from your closet and drawers. Devote today to mending and some laundering. Don’t throw away shirts when all they need is a little work to make them like new again. July 16: It’s about halfway through the summer season. Check if you need to restock any sunscreen, aloe, or even bug bite remedies. July 20: Make some homemade lemonade. Sip it in the coolest room of your house and maybe even read a book while you do it. July 24: Clear 10 files in your filing cabinet. Consider digitalizing some files like warranties or receipts for tax time. How do you plan to stay cool this month?